"Encouraging independence, autonomy, dignity and safety." 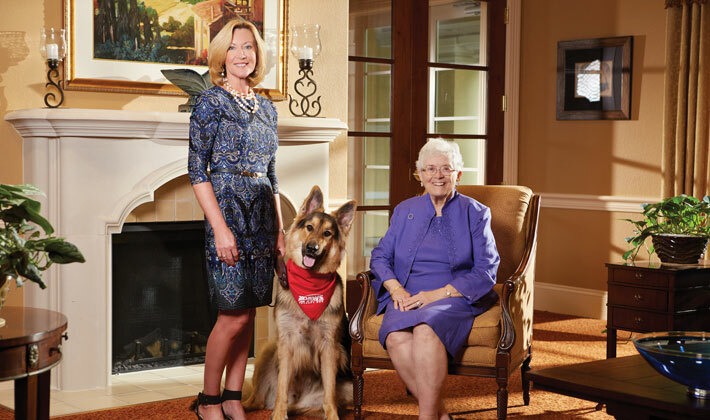 When Wendy Boaz-Hayes needs an assistant while helping families navigate the aging process, including managing dementia and cognitive disabilities, she turns to her beloved therapy dog. "Takoda, certified through PAWS Assistance and Therapy Dogs, adds so much to my practice. Nonverbal clients will talk to him. I see smiles that I don't normally see." But that's just one 'tool' in her kit. A nurse for 30 years and in private practice for six, Wendy is passionate about providing the elderly with the best care possible. Taking a holistic approach to building a care plan, she assesses everything from behavior and social interactions to nutritional needs, medications and illnesses. Giving back to her community, Wendy is Chair of the Board of Directors for SWFL Area Agency on Aging, is on the Board of Directors for Wounded Warrior Anglers of America, Inc. and has completed her twoyear term on the Advisory Council for the Department of Elder Affairs, appointed by Governor Rick Scott.